Visit Blackpool Pleasure Beach, Southport's Pleasureland and Brean Leisure Park on this DVD, the first of a new series of UK amusement park DVDs. Blackpool Pleasure Beach in 1995: The Pepsi Max Big One had opened the previous year, and is seen on this DVD before the first drop was rebuilt. Rides that have since been lost can be seen in action, including the Monster, Tagada (now part of Trauma Towers), Turtle Chase and the figure-of-eight roller coaster, Tokaydo Express. Also see vintage rides such as The Whip, Big Dipper and Derby Racer. Pleasureland (Southport, Merseyside) in 1998: Pleasureland in 1998 was a different world to the park of today. This DVD was shot before the signature Traumatizer roller coaster was constructed and before the park improvements had been carried out which dramatically changed the face of the park. See the Twist and Dodgems operating on the site of Traumatizer, and see vintage rides such as the Caterpillar and Gallopers. Brean Leisure Park (Brean Sands, Somerset) in 2002: This was a fantastic year for the South West's most popular amusement park, with new rides such as Crazy Mouse and Wild Water log flume shown in operation. 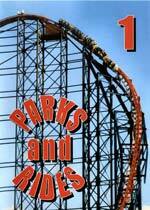 This DVD is pure, unadulterated parks and rides, with no commentary. Click here for discount theme park tickets!